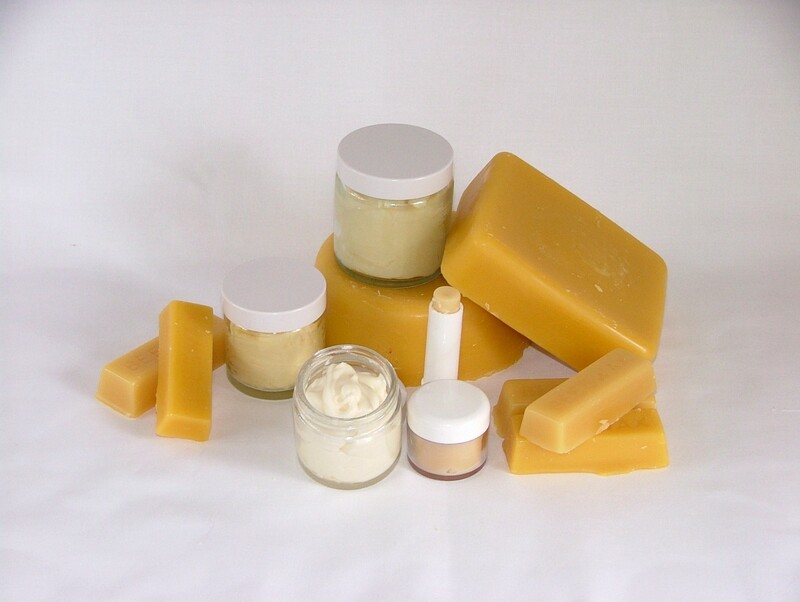 Beeswax softens, protects and heals. Honey is packed with antioxidants. They have been used in skin preparations for centuries. The Foot Cream, Gardeners’ Lavender Hand Cream, and Beeswax Repair Cream are made to the same recipe but with different essential oils: peppermint for tired feet, lavender for hard working hands and lime, lavender and teatree for the repair cream. The skin balm and lip balm are very similar to one another except that the skin balm is softer with a higher proportion of sweet almond oil and has added honey. 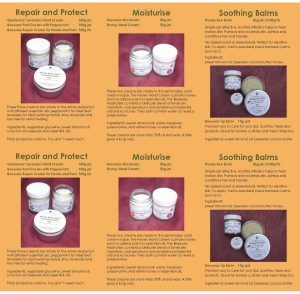 The Moisturiser and Honey Hand Cream are made to the same recipe except that the moisturiser contains essential oils and the hand cream has added honey. Both contain water which makes them a lighter cream, but also means they need a preservative.